Solar Array Junction Boxes (AJB). 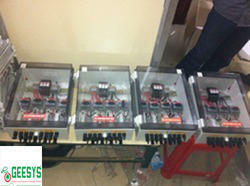 Solar Main Junction Boxes (MJB). Solar String Junction/Combiner Boxes (SJB/SCB). Solar String Junction Box and String Monitoring Unit). DC Distribution Boxes ( DCDB). 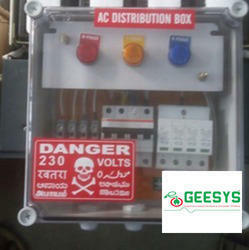 AC Isolator Boxes ( ACIB). 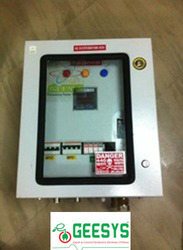 AC Metering Panel ( AMP) . 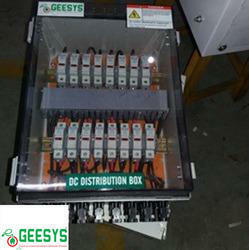 GEESYS Manufacturer & Exporter of DC and AC Distribution Box . 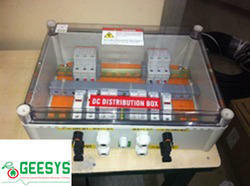 SOLAR DCDB is used to protect the system if there is any fault during failure in DC side. It a important part of SPV system as there should be adequate protection in DC side. 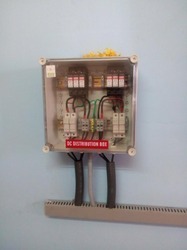 The DCDB incorporates isolator/Breaker to switch off the system during fault, there is a meter which tells you exact PV array voltage and current you are getting. 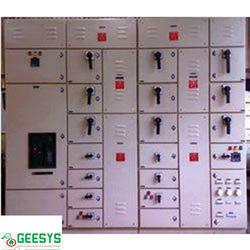 It also have surge protection to save your system from any surges occurred due to fault or other phenomenon. DCDB is used to protect the system if there is any fault during failure in DC side. It a important part of SPV system as there should be adequate protection in DC side. 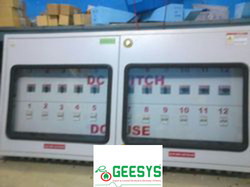 The DCDB incorporates isolator/Breaker to switch off the system during faulDCDB is used to protect the system if there is any fault during failure in DC side. It a important part of SPV system as there should be adequate protection in DC side. The DCDB incorporates isolator/Breaker to switch off the system during fault, there is a meter which tells you exact PV array voltage and current you are getting. It also have surge protection to save your system from any surges occurred due to fault or other phenomenon.DCDB is used to protect the system if there is any fault during failure in DC side. It a important part of SPV system as there should be adequate protection in DC side. The DCDB incorporates isolator/Breaker to switch off the system during fault, there is a meter which tells you exact PV array voltage and current you are getting. It also have surge protection to save your system from any surges occurred due to fault or other phenomenon.t, there is a meter which tells you exact PV array voltage and current you are getting. String combiners connect multiple strings of PV modules to a common output. The combiner box provides input fuses for up to 36 strings and combines those inputs into a single main output. 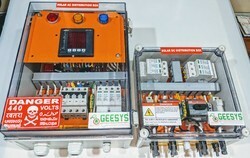 The combiner box may also house other components, such as a DC disconnect, surge protector, current monitoring sensors, arc-fault sensors, and rapid-disconnect contacts . GEESYS offers a broad range of string combiners solutions to meet the requirements of residential, commercial and utility-scale projects in both 600V and 1000V designs. GEESYS combiners are built with the highest quality components and workmanship in our ISO 9001 factory and are NRTL listed to conform with UL STD. 1741 requirements. With a broad range of fuse counts and sizes, enclosure types, and features, Bentek has a solution to satisfy any design specification or requirement. Being counted amongst the leading firms, we are engaged in providing a wide range ofDCDB For Solar Panel. Our products are extremely employed with electrical equipment for varied purposes. In addition, experts on different industry parameters examine these products. Apart from, we also promise to provide an ideal range of products within preset time period. So as to furnish the ever-growing desires of our patrons, we are engrossed in delivering a comprehensive variety of Combiner Box For Solar Panels. Making utilization of topnotch class basic material altogether with sophisticated machinery; these presented products are designed with excellence under executives’ guidance. Also, our clients can get these from us at budget friendly rates. Solar Combiner Box is the one of the solar component.it used to combine the no.of inputs and give single output to the inverter. The combiner box is costomized depending upon the No.of Strings. Combiner box is also used to measure the current and voltage produced from the solar pv system with help of string monitering. 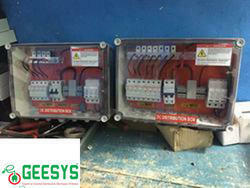 DC Fuse Provide Overcurrent Protection. DC MCB (or) Disconnectors is used as switches. 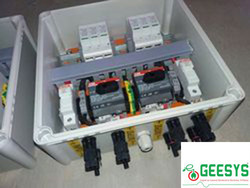 SPD (Surge Protection Device) is used to protect from the Surge and Voltage Spikes. 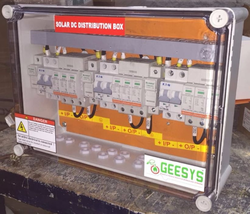 We (GEESYS) offer a wide array of Solar PV Combiner Box that provide interconnection between the input leads from the solar PV modules, and the output lead to the re-combiner box or inverter. 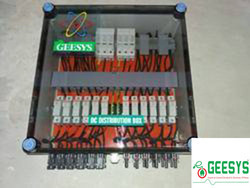 GEESYS Solar Combiner Box is customized for different configurations, based on the number of strings of solar PV modules used in the PV layout. For a set of 10 PV modules arranged two in series and five in parallel, a 5:1 configuration combiner box is selected. The Solar PV Combiner Box can include string monitoring current sensors to provide measurement of string currents. This uses non contact hall sensors for the measurement of string currents. The string currents measured are accessible over MODBUS through a RS-485 communication port by a central monitoring/SCADA software system. We are the key provider a Manufacturing and Supplying an intensive variety of Solar Combiner Box in Chennai, Tamil Nadu, India that is the one of the solar component. 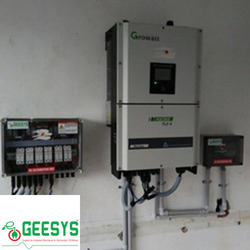 It used to combine the no.of inputs and give single output to the inverter. The combiner box is costomized depending upon the No.of Strings. Combiner box is also used to measure the current and voltage produced from the solar pv system with help of string monitering. 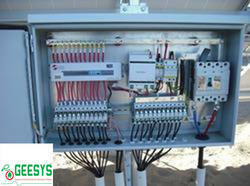 Monitering system is used to provide the generation fo PV System. Solar Combiner BoxThe Array Junction Box combines the multiple DC input coming from the panel termination and converts these into one DC output.These solutions are customisable. We are the leading manufacturer and supplier of Solar Combiner Box. These are manufactuyred from latest technology and high grade material. Being a prominent organization, we are engaged in offering a qualitative collection of Solar Array Junction Box. Precisely designed, this junction box is used in different solar applications. In tune with different requirements of our valued patrons, we provide this box in customized options. 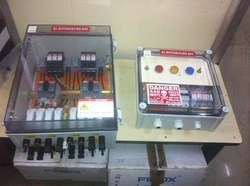 Apart from this, we provide this junction box to our clients within promised time frame and at most genuine rates. Solar array junction box. solar string combiner box solar string combiner box in india, solar string combiner box manufacturer in india, solar string combiner box manufacturer in chennai, solar ac distribution box, solar string combiner box in bangalore, solar string combiner box manufacturer in pune, solar string combiner box manufacturer in hyderabad, solar dcdb, solar dcdb in chennai, solar dcdb manufacturer in chennai, solar array junction box manufacturer in chennai, solar acdb manufacturer in india, solar combiner box in india, solar combiner box manufacturer in india, solar combiner box manufacturer in chennai, solar ac distribution box, solar string combiner box in kolkata, solar string combiner box manufacturer in ahemadabad, solar string combiner box manufacturer in mumbai, solar dcdb, solar dcdb in coimbatore, solar dcdb manufacturer in chennai, solar array junction box manufacturer in india, solar ac combiner box, solar accb, electrical lt power panel, electrical lt panel in chennai. solar acdb manufacturer in india solar array junction boxes, solar combiner boxes, solar string combiner boxes, solar string monitoring system, solar dcdb, solar acdb, solar array junction box in chennai, solar main junction box india, ajb, mjb, solar string junction boxes, distribution board, array junction box, combiner box, dcdb, acdb, solar ajb, string monitoring, solar pv array junction boxes, combiner junction boxes, solar precombiner boxes, solar ajb, solar mjb, dcdb, acdb, solar combiners, solar combiner box manufacturers, solar combiner box manufacturers in india, solar combiner boxes, combiner boxes for solar systems, solar panel combiner, solar string combiner box, string box, string combiner box, string boxes, string monitoring box, photovoltaic combiner box, array combiner box, solarbos combiner box, junction box manufacturers, main junction box, fuse junction box, photovoltaic junction box, array junction box, array junction box solar, solar array junction box, solar array junction box manufacturer, solar combiner box with disconnect, solar junction box, solar pv junction box, solar string junction box, string combiner boxes, array junction box, array junction boxes with string monitor, combiner box solar, solar string combiner box, geesys solar string combiner box, solar string combiner box in india, solar string combiner box manufacturer in india, solar string combiner box manufacturer in chennai, solar ac distribution box, solar string combiner box in bangalore, solar string combiner box manufacturer in pune, solar string combiner box manufacturer in hyderabad, solar dcdb, solar dcdb in chennai, solar dcdb manufacturer in chennai, solar array junction box manufacturer in chennai, solar acdb manufacturer in india, solar combiner box in india, solar combiner box manufacturer in india, solar combiner box manufacturer in chennai, solar ac distribution box, solar string combiner box in kolkata, solar string combiner box manufacturer in ahemadabad, solar string combiner box manufacturer in mumbai, solar dcdb, solar dcdb in coimbatore, solar dcdb manufacturer in chennai, solar array junction box manufacturer in india, solar ac combiner box, solar accb, electrical lt power panel, electrical lt panel in chennai. 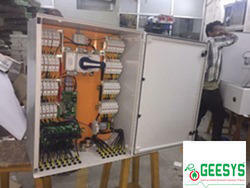 GEESYS offers Solar PV Array Junction Boxes and integrated sub systems like PV string disconnector boxes, array / combiner junction boxes, main junction boxes, ACDB, DCDB for photovoltaic PV application in India. These Solar PV Array Junction Boxes basically collect DC power from [generally 4 to 16] PV strings. Collected power is then transferred either directly or through a main junction box [MJB] to power inverter. The Power inverter converts the DC power to AC which after metering is used for captive consuption [off grid application] or supplied [sold] to the grid. 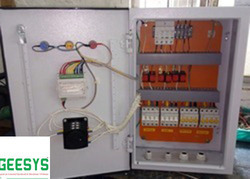 Array Junction Boxes are provided with one or more of the accessories mentioned below to improve their functionality. --> Plug in [plug out] type PV string input connectors: these special connectors enable quick yet reliable connection and disconnection of the PV string from the array junction box. This is useful during maintance and site upgradation work. --> Individual string performance monitoring device and device for data transfer to control room. Competitive Advantages of the product1. AJB made from imported refined Poly carbonate material. 2. The box provides IP 65 level protection from dust and water. 3. It is Class II electrical enclosure & is UL 94 certified. 4. 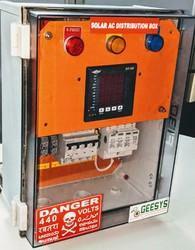 Hanut India can fully customize the PV generator junction boxes to meet customers' special requirements. 5. Array junction boxes by Hanut India are installed in several MW size solar PV power plants and also in telecom tower based solar PV projects. Our range of products include SOLAR PROJECTS such as Solar AJB, Solar ACDB, Polycarbonate Junction Box, Solar AC Distribution Board, Solar ACDC Distribution Board, Solar Array Combiner Box and many more items. olar DCDB As you all know that we are a Manufacturer of IP66 ABS and Polycarbonate Enclsoures. So we planned to enter into solar and attached is few images which we have supplied to our exisitng Clients. we are having very good offers for Solar AJBs, Combiners. With the valuable assistance of highly skilled and experienced professionals, we are engaged in offering quality approved assortments of Solar Combiner Boxto our valued clients. 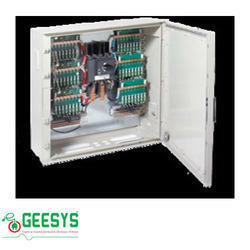 Owing to the presence of our expert team members, we have been able to offer Main Junction Box. We Have The Following Products As High Quality Manufacturing Products. Solar Array Junction Box In India. 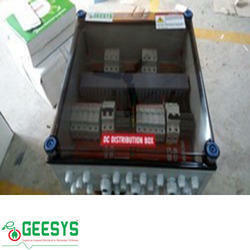 Solar Combiner Box GEESYS offers array junction (DC combiner) boxes that provide interconnection between the input leads from the solar PV modules, and the output lead to the re-combiner Box or inverter. The combiner box is customized for different configurations, based on the number of strings of solar PV modules used in the PV layout. hese Solar Combiner Boxes has wide applications in commercial as well as domestic establishments in supply of power and electricity. These Solar Combiner Boxes are easy to install and can easily be maintained. 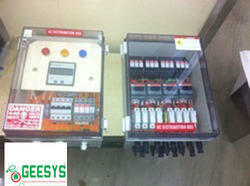 These Solar Combiner Boxes are offered in various specifications and sizes. 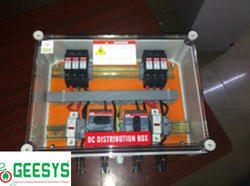 Additionally, our clients can avail these Solar Combiner Boxes at affordable rates. In order to keep pace with the ever growing demands of our clients, we are involved in offering supreme quality range of Solar String Combiner Box. The SMB house many components such as a Fuses, Disconnector switch, surge protection device, cables, busbar, & PCB (being the heart of the box). 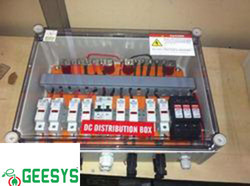 GEESYS offers a wide range of string combiner solutions to cater the needs of residential, commercial and utility-scale projects i.e from 600 V DC to 1500 V DC designs. 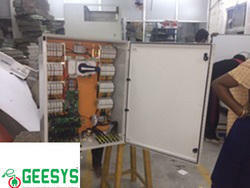 GEESYS combiner box is available in various customizable configurations, designed & built with top quality components & workmanship at our ISO 9001 factory (In process) and comply with IEC & UL standards. Strict engineering design rules & our world class manufacturing facility helps is building a high quality product with unmatched level of reliability at a competitive price thereby ensuring a long product life in challenging environmental conditions. The boxes can be installed quickly, safely and easily both indoors and outdoors thanks to their compact dimensions, while their robust enclosure guarantees durability and reliable safety in the PV field. The SMA String-Combiners with 24 and 32 string inlets are fitted with two cable outlets per pole as standard and cover – just like the Combiner with 16 string inlets – a sealing range of 17 to 38.5 millimeters. Cables with cross-sections of 70 to 400 mm² can be inserted. Also read our blog post about the SMA String-Combiner. Our products are IP65, IP66, IK07, IK08 and are of top industrial Quality. 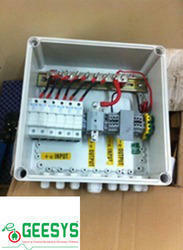 We design and supply Combiner boxes suitable for 2 string, 4 string, 6 string, 12 string or more PV modules. All AJBs have IP68 Ventilation devices. We design AJB as per customer specific requirement and can be customized as per requirements of project. Solar AJB is the equipment to combine the DC voltage generated from a number of solar photovoltaic panels. It is important and necessary equipment in the solar photovoltaic electric generation system, because it reduces the cable between PV modules and Charge Controllers/Inverters, to facilitate maintenance and improve reliability. Solar Array Junction Box is meant for combining all the incoming lines from the solar panel strings/arrays and deriving one common array output for the multiple array inputs. 1) To Block the reverse flow of current from the battery to solar panels during nights or low radiation levels. SOLAR AJB Manufacturer in Chennai. SOLAR AJB Manufacturer in India. Solar Array Junction Box options offered can be made available by us in both standard and customized finish sizes. An Solar Array Junction Box is a container for electrical connections, usually intended to conceal them from sight and deter tampering. A small metal or plastic junction box may form part of an electrical conduit or thermoplastic-sheathed cable (TPS) wiring system in a building. If designed for surface mounting, Solar Array Junction Box is used mostly in ceilings, under floors or concealed behind an access panel - particularly in domestic or commercial buildings. An appropriate type (such as that shown on the right) may be buried in the plaster of a wall (although full concealment is no longer allowed by modern codes and standards) or cast into concrete - with only the cover visible. 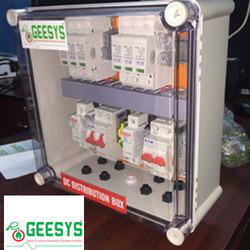 GEESYS offers array junction (DC combiner) boxes that provide interconnection between the input leads from the solar PV modules, and the output lead to the re-combiner box or inverter. The combiner box is customized for different configurations, based on the number of strings of solar PV modules used in the PV layout. For a set of 10 PV modules arranged two in series and five in parallel, a 5:1 configuration combiner box is selected. IP65 Enclosure: The combiner box enclosures are typically made out of thermoset (GRP or polyester), or thermoplastic (polycarbonate) material, and come with IP65 protection. Enclosures come in different sizes, depending on the number of input strings and protection features implemented in the combiner box. Fuse Protection for Strings: DC fuses rated from 2A to 25A from leading manufacturers are used in the combiner box to provide overcurrent protection. Fuses can be provided with or without indication. Surge Protection Device : Surge Protection devices or SPD’s in the combiner/junction box protects electrical and electronic equipments from the power surges and voltage spikes. Surge protection devices divert the excess voltage and current from transient or surge into grounding wires. SPD’s used by Nordic Asia in the combiner boxes meet Type 2 regulations, and are typically rated between 600 to 1000V. Cable Glands/Connectors : The combiner/ array junction box offered by Nordic Asia is provided with IP 67 rated Cable Glands or MC 4 connectors at the input and output side to terminate the array strings into the box. String Monitoring (Optional): Our String Monitoring Combiner Box uses non contact Hall sensors for the measurement of string currents. The string currents measured are accessible over MODBUS through a RS-485 communication port by central monitoring/SCADA software. 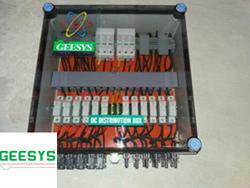 We are GEESYS Technologies, Offering Cooper Bussmann Combiner box for various range and applications. 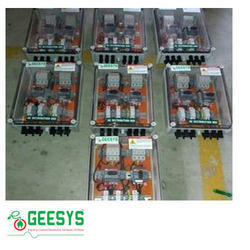 These kinds of combiner boxes are mainly designed to reduce the system cost by providing maximum flexibility. We have carved a niche amongst the most trusted names of this domain, instrumental in offering premium quality range of Solar Array Junction Box. With years of industrial experience and expertise, we are involved in providing PV Array Box. 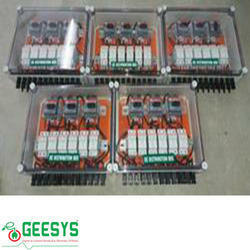 We have risen to prominence in offering Array Junction Box to our clients. This product is widely used in various sectors to join telephone wires, computer wires, electrical wires and others. This product is thoroughly tested under the guidance of our experts in order to ensure shock resistance. Our clients can avail this product in different dimension. 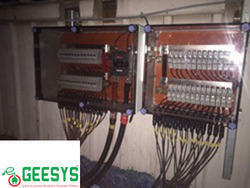 Our company is highly rated in offering String Monitoring Box to our clients. This product is aesthetically designed and precision-engineered for its higher performance and sturdy construction. In addition to this, this product is rigidly tested on various quality parameters. This product can also be customized as per the requirements specified by the clients. We are involved in presenting best and exceptional quality gathering of AJB For Solar Panel. These products are designed particularly for diverse purpose. Offered products are heat resistance and obtainable in many provisions. Furthermore, these products are consistent, seamless in finish and accessible at friendly pocket rates. 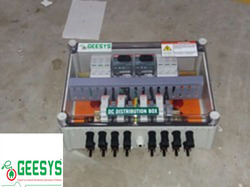 GEESYS Technologies is specilised in manufacturing Combiner Box, as per the customer reqiurement.We offer Combiner box is generally used to interconnect multiple number of inputs together to provide single DC source. 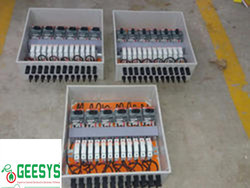 The combiner box sizing is customized depending upon the number of strings with each input fused seperately. 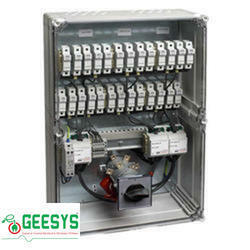 GEESYS SOLAR STRING COMBINER BOX is provides detailed information about the power generated by each string of PV modules. provides information about out-of-order or disturbed strings. Upon occurrence of a fault in the power plant the system gives clear and visible reference points of the place, where the fault is registered and the nature of the fault. Such information is accompanied by a visual alarm in the concerned field array junction box and the central monitoring server. each measuring module does a self-check up on power ON. 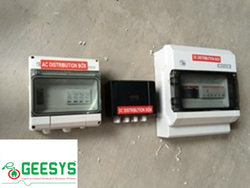 the system installation is easy and quick as the measuring module comes pre installed in the array junction box provided by GEESYS. 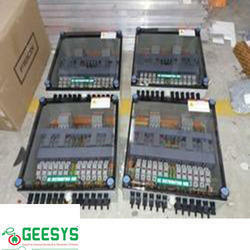 GEESYS can customize the array junction box as per plant operator's requirements. The string monitoring module needs NO additional cabling for power supply and data transmission as it takes power from the PV module strings and transmits data to the central server wirelessly. Absence of power and data transmission wires is a very big advantage. 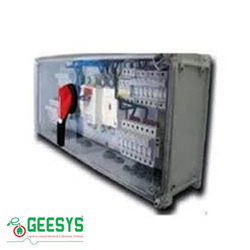 GEESYS offers enclosures and integrated sub systems like PV string disconnector boxes, array / combiner junction boxes, main junction boxes, ACDB, DCDB for photovoltaic PV application in India. SOLAR Array Junction Boxes [AJB], also referred to as solar PV generator junction boxes and combiner boxes, basically collect DC power from [generally 4 to 16] PV strings. Collected power is then transferred either directly or through a main junction box [MJB] to power inverter. The Power inverter converts the DC power to AC which after metering is used for captive consuption [off grid application] or supplied [sold] to the grid. Solar Array Junction Boxes are provided with one or more of the accessories mentioned below to improve their functionality. --> and device for data transfer to control room. This is useful in case of large PV installations. This enables easy identification of PV modules that are performing at below optimal level. 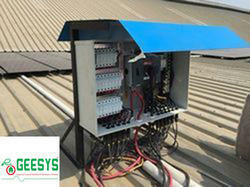 after identification such PV panels / modules can be repaired or replaced. Because Array Junction Boxes are installed in outdoor environment near the PV modules they are normally required to be made from a material that is rugged, fire resistant, electrically insulated and UV resistant. Poly carbonate is one such material. Hanut India is supplying Solar Array Junction Boxes made from imported refined Poly carbonate material. The box provides IP 65 level protection from dust and water. Having invested huge amount of capital in their solar PV plants, the plant operators want to get the maximum output from their photovoltaic power plants. The solar photovoltaic plant operators want to know the reason behind any / every fall in the PV plants output - whether the fall is due to some known cause [cloudy weather, planned maintenance,... etc.] or the fall is due to a fault in the plant that needs to be rectified. And, in case of fault, they want to know the exact location of the fault. A solar PV plant typically has hundreds / thousands of PV modules spread over a large area. Using conventional means finding answers to both these questions is very difficult and/or time consuming. 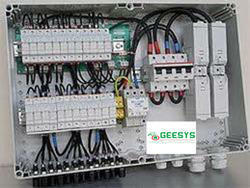 The string monitoring and diagnostics system offered by GEESYS is a smart solution to above mentioned problems. The string monitoring and diagnostics system provides clear and up to the minute information about the entire generating section of the solar plant. 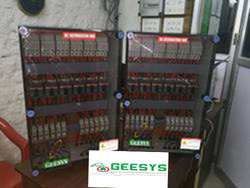 Alarms are displayed locally and on the central monitoring server showing the exact PV module string / array junction box with fault for immediate action by the plant operators. 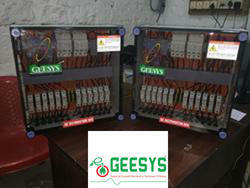 The string monitoring and diagnostics system offered by GEESYS is affordable and simple to install. 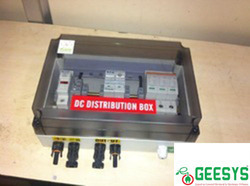 SOLAR ACDB, SOLAR ARRAY JUNCTION BOX, SOLAR DC DISTRIBUTION BOX. 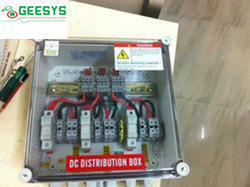 SOLAR ACDB, SOLAR STRING COMBINER BOX and SOLAR ARRAY JUNCTION BOXES in India. Solar string combiner box solar string combiner box in india, solar string combiner box preparer in india, solar string combiner box preparer in chennai, solar ac distribution box, solar string combiner box in bangalore, solar string combiner box preparer in pune, solar string combiner box preparer in hyderabad, solar dcdb, solar dcdb in chennai, solar dcdb preparer in chennai, solar array junction box preparer in chennai, solar acdb preparer in india, solar combiner box in india, solar combiner box preparer in india, solar combiner box preparer in chennai, solar ac distribution box, solar string combiner box in kolkata, solar string combiner box preparer in ahemadabad, solar string combiner box preparer in mumbai, solar dcdb, solar dcdb in coimbatore, solar dcdb preparer in chennai, solar array junction box preparer in india, solar ac combiner box, solar accb, electrical lt power panel, electrical lt panel in chennai. Solar string combiner box solar string combiner box in india, solar string combiner box manufacturer in india, solar string combiner box manufacturer in chennai, solar ac distribution box, solar string combiner box in bangalore, solar string combiner box manufacturer in pune, solar string combiner box manufacturer in hyderabad, solar dcdb, solar dcdb in chennai, solar dcdb manufacturer in chennai, solar array junction box manufacturer in chennai, solar acdb manufacturer in india, solar combiner box in india, solar combiner box manufacturer in india, solar combiner box manufacturer in chennai, solar ac distribution box, solar string combiner box in kolkata, solar string combiner box manufacturer in ahemadabad, solar string combiner box manufacturer in mumbai, solar dcdb, solar dcdb in coimbatore, solar dcdb manufacturer in chennai, solar array junction box manufacturer in india, solar ac combiner box, solar accb, electrical lt power panel, electrical lt panel in chennai. solar acdb manufacturer in india solar array junction boxes, solar combiner boxes, solar string combiner boxes, solar string monitoring system, solar dcdb, solar acdb, solar array junction box in chennai, solar main junction box india, ajb, mjb, solar string junction boxes, distribution board, array junction box, combiner box, dcdb, acdb, solar ajb, string monitoring, solar pv array junction boxes, combiner junction boxes, solar precombiner boxes, solar ajb, solar mjb, dcdb, acdb, solar combiners, solar combiner box manufacturers, solar combiner box manufacturers in india, solar combiner boxes, combiner boxes for solar systems, solar panel combiner, solar string combiner box, string box, string combiner box, string boxes, string monitoring box, photovoltaic combiner box, array combiner box, solarbos combiner box, junction box manufacturers, main junction box, fuse junction box, photovoltaic junction box, array junction box, array junction box solar, solar array junction box, solar array junction box manufacturer, solar combiner box with disconnect, solar junction box, solar pv junction box, solar string junction box, string combiner boxes, array junction box, array junction boxes with string monitor, combiner box solar, solar string combiner box, geesys solar string combiner box, solar string combiner box in india, solar string combiner box manufacturer in india, solar string combiner box manufacturer in chennai, solar ac distribution box, solar string combiner box in bangalore, solar string combiner box manufacturer in pune, solar string combiner box manufacturer in hyderabad, solar dcdb, solar dcdb in chennai, solar dcdb manufacturer in chennai, solar array junction box manufacturer in chennai, solar acdb manufacturer in india, solar combiner box in india, solar combiner box manufacturer in india, solar combiner box manufacturer in chennai, solar ac distribution box, solar string combiner box in kolkata, solar string combiner box manufacturer in ahemadabad, solar string combiner box manufacturer in mumbai, solar dcdb, solar dcdb in coimbatore, solar dcdb manufacturer in chennai, solar array junction box manufacturer in india, solar ac combiner box, solar accb, electrical lt power panel, electrical lt panel in chennai. Solar array junction box. solar string combiner box solar string combiner box in india, solar string combiner box manufacturer in india, solar string combiner box manufacturer in chennai, solar ac distribution box, solar string combiner box in bangalore, solar string combiner box manufacturer in pune, solar string combiner box manufacturer in hyderabad, solar dcdb, solar dcdb in chennai, solar dcdb manufacturer in chennai, solar array junction box manufacturer in chennai, solar acdb manufacturer in india, solar combiner box in india, solar combiner box manufacturer in india, solar combiner box manufacturer in chennai, solar ac distribution box, solar string combiner box in kolkata, solar string combiner box manufacturer in ahemadabad, solar string combiner box manufacturer in mumbai, solar dcdb, solar dcdb in coimbatore, solar dcdb manufacturer in chennai, solar array junction box manufacturer in india, solar ac combiner box, solar accb, electrical lt power panel, electrical lt panel in chennai. Solar acdb solar string combiner box in india, solar string combiner box manufacturer in india, solar string combiner box manufacturer in chennai, solar ac distribution box, solar string combiner box in bangalore, solar string combiner box manufacturer in pune, solar string combiner box manufacturer in hyderabad, solar dcdb, solar dcdb in chennai, solar dcdb manufacturer in chennai, solar array junction box manufacturer in chennai, solar acdb manufacturer in india, solar combiner box in india, solar combiner box manufacturer in india, solar combiner box manufacturer in chennai, solar ac distribution box, solar string combiner box in kolkata, solar string combiner box manufacturer in ahemadabad, solar string combiner box manufacturer in mumbai, solar dcdb, solar dcdb in coimbatore, solar dcdb manufacturer in chennai, solar array junction box manufacturer in india, solar ac combiner box, solar accb, electrical lt power panel, electrical lt panel in chennai. solar acdb manufacturer in india solar array junction boxes, solar combiner boxes, solar string combiner boxes, solar string monitoring system, solar dcdb, solar acdb, solar array junction box in chennai, solar main junction box india, ajb, mjb, solar string junction boxes, distribution board, array junction box, combiner box, dcdb, acdb, solar ajb, string monitoring, solar pv array junction boxes, combiner junction boxes, solar precombiner boxes, solar ajb, solar mjb, dcdb, acdb, solar combiners, solar combiner box manufacturers, solar combiner box manufacturers in india, solar combiner boxes, combiner boxes for solar systems, solar panel combiner, solar string combiner box, string box, string combiner box, string boxes, string monitoring box, photovoltaic combiner box, array combiner box, solarbos combiner box, junction box manufacturers, main junction box, fuse junction box, photovoltaic junction box, array junction box, array junction box solar, solar array junction box, solar array junction box manufacturer, solar combiner box with disconnect, solar junction box, solar pv junction box, solar string junction box, string combiner boxes, array junction box, array junction boxes with string monitor, combiner box solar, solar string combiner box, geesys solar string combiner box, solar string combiner box in india, solar string combiner box manufacturer in india, solar string combiner box manufacturer in chennai, solar ac distribution box, solar string combiner box in bangalore, solar string combiner box manufacturer in pune, solar string combiner box manufacturer in hyderabad, solar dcdb, solar dcdb in chennai, solar dcdb manufacturer in chennai, solar array junction box manufacturer in chennai, solar acdb manufacturer in india, solar combiner box in india, solar combiner box manufacturer in india, solar combiner box manufacturer in chennai, solar ac distribution box, solar string combiner box in kolkata, solar string combiner box manufacturer in ahemadabad, solar string combiner box manufacturer in mumbai, solar dcdb, solar dcdb in coimbatore, solar dcdb manufacturer in chennai, solar array junction box manufacturer in india, solar ac combiner box, solar accb, electrical lt power panel, electrical lt panel in chennai. Solar array junction box solar string combiner box in india, solar string combiner box manufacturer in india, solar string combiner box manufacturer in chennai, solar ac distribution box, solar string combiner box in bangalore, solar string combiner box manufacturer in pune, solar string combiner box manufacturer in hyderabad, solar dcdb, solar dcdb in chennai, solar dcdb manufacturer in chennai, solar array junction box manufacturer in chennai, solar acdb manufacturer in india, solar combiner box in india, solar combiner box manufacturer in india, solar combiner box manufacturer in chennai, solar ac distribution box, solar string combiner box in kolkata, solar string combiner box manufacturer in ahemadabad, solar string combiner box manufacturer in mumbai, solar dcdb, solar dcdb in coimbatore, solar dcdb manufacturer in chennai, solar array junction box manufacturer in india, solar ac combiner box, solar accb, electrical lt power panel, electrical lt panel in chennai. solar acdb manufacturer in india solar array junction boxes, solar combiner boxes, solar string combiner boxes, solar string monitoring system, solar dcdb, solar acdb, solar array junction box in chennai, solar main junction box india, ajb, mjb, solar string junction boxes, distribution board, array junction box, combiner box, dcdb, acdb, solar ajb, string monitoring, solar pv array junction boxes, combiner junction boxes, solar precombiner boxes, solar ajb, solar mjb, dcdb, acdb, solar combiners, solar combiner box manufacturers, solar combiner box manufacturers in india, solar combiner boxes, combiner boxes for solar systems, solar panel combiner, solar string combiner box, string box, string combiner box, string boxes, string monitoring box, photovoltaic combiner box, array combiner box, solarbos combiner box, junction box manufacturers, main junction box, fuse junction box, photovoltaic junction box, array junction box, array junction box solar, solar array junction box, solar array junction box manufacturer, solar combiner box with disconnect, solar junction box, solar pv junction box, solar string junction box, string combiner boxes, array junction box, array junction boxes with string monitor, combiner box solar, solar string combiner box, geesys solar string combiner box, solar string combiner box in india, solar string combiner box manufacturer in india, solar string combiner box manufacturer in chennai, solar ac distribution box, solar string combiner box in bangalore, solar string combiner box manufacturer in pune, solar string combiner box manufacturer in hyderabad, solar dcdb, solar dcdb in chennai, solar dcdb manufacturer in chennai, solar array junction box manufacturer in chennai, solar acdb manufacturer in india, solar combiner box in india, solar combiner box manufacturer in india, solar combiner box manufacturer in chennai, solar ac distribution box, solar string combiner box in kolkata, solar string combiner box manufacturer in ahemadabad, solar string combiner box manufacturer in mumbai, solar dcdb, solar dcdb in coimbatore, solar dcdb manufacturer in chennai, solar array junction box manufacturer in india, solar ac combiner box, solar accb, electrical lt power panel, electrical lt panel in chennai. Solar array junction box solar string combiner box in india, solar string combiner box manufacturer in india, solar string combiner box manufacturer in chennai, solar ac distribution box, solar string combiner box in bangalore, solar string combiner box manufacturer in pune, solar string combiner box manufacturer in hyderabad, solar dcdb, solar dcdb in chennai, solar dcdb manufacturer in chennai, solar array junction box manufacturer in chennai, solar acdb manufacturer in india, solar combiner box in india, solar combiner box manufacturer in india, solar combiner box manufacturer in chennai, solar ac distribution box, solar string combiner box in kolkata, solar string combiner box manufacturer in ahemadabad, solar string combiner box manufacturer in mumbai, solar dcdb, solar dcdb in coimbatore, solar dcdb manufacturer in chennai, solar array junction box manufacturer in india, solar ac combiner box, solar accb, electrical lt power panel, electrical lt panel in chennai. olar acdb manufacturer in india solar array junction boxes, solar combiner boxes, solar string combiner boxes, solar string monitoring system, solar dcdb, solar acdb, solar array junction box in chennai, solar main junction box india, ajb, mjb, solar string junction boxes, distribution board, array junction box, combiner box, dcdb, acdb, solar ajb, string monitoring, solar pv array junction boxes, combiner junction boxes, solar precombiner boxes, solar ajb, solar mjb, dcdb, acdb, solar combiners, solar combiner box manufacturers, solar combiner box manufacturers in india, solar combiner boxes, combiner boxes for solar systems, solar panel combiner, solar string combiner box, string box, string combiner box, string boxes, string monitoring box, photovoltaic combiner box, array combiner box, solarbos combiner box, junction box manufacturers, main junction box, fuse junction box, photovoltaic junction box, array junction box, array junction box solar, solar array junction box, solar array junction box manufacturer, solar combiner box with disconnect, solar junction box, solar pv junction box, solar string junction box, string combiner boxes, array junction box, array junction boxes with string monitor, combiner box solar, solar string combiner box, geesys solar string combiner box, solar string combiner box in india, solar string combiner box manufacturer in india, solar string combiner box manufacturer in chennai, solar ac distribution box, solar string combiner box in bangalore, solar string combiner box manufacturer in pune, solar string combiner box manufacturer in hyderabad, solar dcdb, solar dcdb in chennai, solar dcdb manufacturer in chennai, solar array junction box manufacturer in chennai, solar acdb manufacturer in india, solar combiner box in india, solar combiner box manufacturer in india, solar combiner box manufacturer in chennai, solar ac distribution box, solar string combiner box in kolkata, solar string combiner box manufacturer in ahemadabad, solar string combiner box manufacturer in mumbai, solar dcdb, solar dcdb in coimbatore, solar dcdb manufacturer in chennai, solar array junction box manufacturer in india, solar ac combiner box, solar accb, electrical lt power panel, electrical lt panel in chennai. We offer a wide range of Array Junction Boxes, String Monitoring Boxes, and DC Fuse Boxes suitable for combining PV panel strings at various levels. 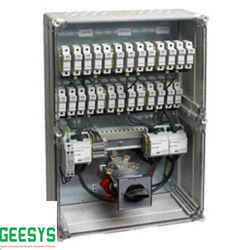 These combiner boxes can easily handle high voltage PV strings and give on-line current data of each string used to reliably detect reduced generation or failure of any string. The product is 100% customizable and is suitable for harsh weather conditions. 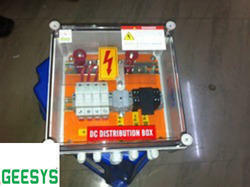 Solar array junction box solar string combiner box in india, solar string combiner box preparer in india, solar string combiner box preparer in chennai, solar ac distribution box, solar string combiner box in bangalore, solar string combiner box preparer in pune, solar string combiner box preparer in hyderabad, solar dcdb, solar dcdb in chennai, solar dcdb preparer in chennai, solar array junction box preparer in chennai, solar acdb preparer in india, solar combiner box in india, solar combiner box preparer in india, solar combiner box preparer in chennai, solar ac distribution box, solar string combiner box in kolkata, solar string combiner box preparer in ahemadabad, solar string combiner box preparer in mumbai, solar dcdb, solar dcdb in coimbatore, solar dcdb preparer in chennai, solar array junction box preparer in india, solar ac combiner box, solar accb, electrical lt power panel, electrical lt panel in chennai. Solar acdb preparer in india solar array junction boxes, solar combiner boxes, solar string combiner boxes, solar string monitoring system, solar dcdb, solar acdb, solar array junction box in chennai, solar main junction box india, ajb, mjb, solar string junction boxes, distribution board, array junction box, combiner box, dcdb, acdb, solar ajb, string monitoring, solar pv array junction boxes, combiner junction boxes, solar precombiner boxes, solar ajb, solar mjb, dcdb, acdb, solar combiners, solar combiner box preparers, solar combiner box preparers in india, solar combiner boxes, combiner boxes for solar systems, solar panel combiner, solar string combiner box, string box, string combiner box, string boxes, string monitoring box, photovoltaic combiner box, array combiner box, solarbos combiner box, junction box preparers, main junction box, fuse junction box, photovoltaic junction box, array junction box, array junction box solar, solar array junction box, solar array junction box preparer, solar combiner box with disconnect, solar junction box, solar pv junction box, solar string junction box, string combiner boxes, array junction box, array junction boxes with string monitor, combiner box solar, solar string combiner box, geesys solar string combiner box, solar string combiner box in india, solar string combiner box preparer in india, solar string combiner box preparer in chennai, solar ac distribution box, solar string combiner box in bangalore, solar string combiner box preparer in pune, solar string combiner box preparer in hyderabad, solar dcdb, solar dcdb in chennai, solar dcdb preparer in chennai, solar array junction box preparer in chennai, solar acdb preparer in india, solar combiner box in india, solar combiner box preparer in india, solar combiner box preparer in chennai, solar ac distribution box, solar string combiner box in kolkata, solar string combiner box preparer in ahemadabad, solar string combiner box preparer in mumbai, solar dcdb, solar dcdb in coimbatore, solar dcdb preparer in chennai, solar array junction box preparer in india, solar ac combiner box, solar accb, electrical lt power panel, electrical lt panel in chennai.